SkillsUSA revealed two competitors who will represent the United States in Cyber Security at WorldSkills, the largest international showcase of the skilled trades. The August 2019 WorldSkills event marks the first time countries will compete in the Cyber Security category. Jason McGee, age 18, from San Tan Valley, Ariz., will compete as a team as part of WorldSkills USA in Kazan, Russia, this year. 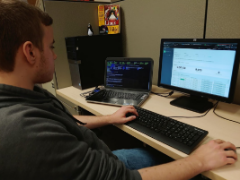 Jason began working at Vigilant as an intern and quickly worked his way up to a technician. His partner Mawadda Abuhamda, age 17, is also from Chandler, Arizona. “The risk for cyberattacks is increasing, along with the need for skilled workers who are trained to ensure network security online. These two competitors are incredibly important and valuable additions to the WorldSkills USA team, and I am excited that our largest WorldSkills contingent ever continues to grow,” says SkillsUSA Executive Director Tim Lawrence. In November 2018, Vigilant was one of 10 companies selected - out of an applicant field of 200 - to participate in the Hyperspace Challenge event in Albuquerque. 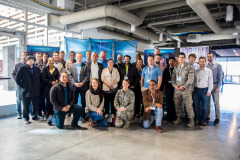 The event, sponsored by the Air Force Research Labs, New Mexico Tech, and ABQid (an Albuquerque startup incubator), resulted in several cash awards for participants and the opportunity to network with several potential clients and problem sponsors. One of the biggest outcomes of the event was the creation of a new SBIR topic for the various startups to propose on. The SBIR topic, “Commercial Solutions for Innovative Space Data Analytics”, was set up as part of the Air Force’s Special Topic series for the first quarter of 2019. Specifically, the topic gives small AI startups like ours the opportunity to adapt our proprietary software technology to some of the emergent problems in the Air Force data environment. Winning companies will receive up to $75,000 towards a feasibility study, which can lead to even greater future funding as our solution grows to meet the criteria set by the Air Force and eventually to full commercialization in the future! Vigilant will be entering our proposal in the coming days. Be sure to stay tuned here for news and updates on this exciting new effort! Have you seen the error "The trust relationship between this workstation and the primary domain failed” while working with Active Directory? The reason why this problem happens is because of a "password mismatch." Passwords are typically thought of as something that is assigned to a user account. However, in Active Directory environments each computer account also has an internal password. If the copy of the computer account password that is stored within the member server gets out of sync with the password copy that is stored on the domain controller then the trust relationship will be broken as a result. So how can you fix this error? Click the link below to read the Knowledgebase article! Don't follow us on social media? Here's a look at the latest technology news we share! Follow us on Facebook, Twitter, and LinkedIn by clicking the buttons below! The popular open-source hacking and security tool Metasploit has received its first major update since 2011. Hackers and security professionals alike leverage Metasploit Framework's power to create custom security tools or write their own exploit code for new security holes. One of the updates includes the ability to target multiple targets without needing to write a script or manual interaction. Read about the new features to the framework below! Temporary patches are now available for all three Windows zero-day bugs that have been discovered during the past month. The patches are available by a third-party security firm as Microsoft did not release official fixes at the start of the month during its regular Patch Tuesday update window. Review the patches and the zero-day bugs in greater detail from ZDNet below!